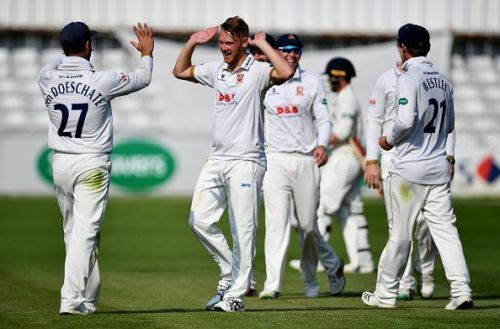 After rain gobbled up the first match at Yorkshire, Essex bounced back to register their first win this season. In a bowling friendly pitch, after both the teams were out for cheap in the first innings, a collective batting display from the hosts notched up their total to 313. Both Harmer and Wesley were sent back a run short of their half-centuries and Foster stood strong for 3 hours, adding 69 to the board. However, Lancashire's bowlers gave away a run more than Bopara's score (26), which played very well to the defending champion's advantage. Porter bowled a beauty to knock off Hameed's off-stump at the end of the third over, and thus began the second phase of his wickets' quest. The man had shared 10 wickets with Harmer equally in the first innings. Although Davies and Clark tried to give a stand for their team, it was Porter's day and he picked them both in LBWs. Mennie, along with Onions couldn't make much of an impact in this match but scored a crucial half-century in the end. However, Porter had the last laugh, bowling him out to get to a match figure of 9/80.